Welcome to StarWarsInterviews.com! On this website you’ll find over 175 (and counting) unique, self conducted interviews I had with people who worked on the Star Wars movies and spin offs. In 1983 I was introduced to Star Wars. In that year (I had just turned 7) I saw some bits of the famous Sarlacc Pit scene from Return of the Jedi (which was just released) on television. Shortly after this I saw it at the cinema and became a fan for life. This was my first step into what Obi-Wan calls ‘a larger world’. Over the years that followed I never lost interest and things got serious. I worked for various Star Wars websites and on two occasions as the personal assistant of my childhood hero: Anthony ‘C-3PO’ Daniels. Another thing I started to do was to interview all the people involved with Star Wars: cast, crew, you name it. Many of these interviews were mentioned in the credits of various Star Wars books including ‘The Making of Return of the Jedi’, ‘Stormtroopers Beyond the Armor’, ‘Star Wars Icons: Han Solo’ and ‘The Star Wars Archives’ and my own book series: ‘Star Wars Interviews’ (see below for details). This website is a collection of all the interviews I have done since 2005. This site is about everyone involved with the Star Wars movies and spin offs. The cast, the crew…it’s a large online collection unique, self-conducted interviews. Nothing but stories from the people who worked on the biggest saga ever. Over the years I have appeared in several books, TV and radio shows and other media. By clicking on the link you’re directed to the video/article/site. Heroes Dutch Comic Con – November 2018: I was a guest at this event and did a live interview on stage about my book plus a signing session afterwards. Omroep Brabant – May 2017: on May the 4th (International Star Wars Day) I was live on TV in the show “Wakker”. Omroep Brabant – December 2016: A TV crew visited me at home for an item about Rogue One. Besides the video there was also an article. Various stations – April 2007: Not Star Wars related, but in April 2007 I was interviewed by a camera crew at the ‘Atmosfere Spaziali’ press day at the Space Expo. E.T.’s creator Carlo Rambaldi was there and I was asked to share some of my ‘E.T. memories’. The segment was shown on every regional TV station in the Netherlands. Omroep Max – September 2017: In September 2017 the Star Wars Identities exhibition was opened in The Netherlands. The host (Manuela Kemp) interviewed me about the exhibit. Omroep Brabant – April 2015: I was interviewed by Omroep Brabant. The reason? The Force Awakens panel at Star Wars Celebration. Radio 1 – May 2011: On May 25 2011 (the 34th anniversary of Star Wars) I was interviewed by Dutch Radio station Radio 1 for the show “Nu Al Wakker Nederland”. Omroep Brabant – May 2005: I was featured in a live radio show from Omroep Brabant called “Een Robbertje Bartol”. For 30 minutes they interviewed me because Revenge of the Sith had just been released and I had seen the movie a few days in advance at a press screening. MightyGoods (Internet) – 2018: This website which specializes in bags and travelling interviewed me about attending conventions. 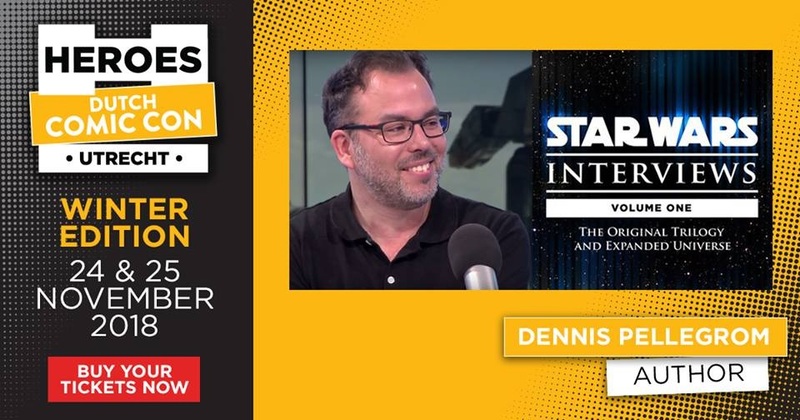 NOS (Internet) – December 2017: The biggest Dutch TV station interviewed me about the most notorious piece of Star Wars history: the Holiday Special from 1978. Metro (Newspaper) – May 2017: For an article about ‘May the 4th’ I was interviewed by this paper. Sarlacc Pit Podcast (Podcast) – July 2010: I was a guest in the Sarlacc Pit podcast #4. It was an interview about my website and Star Wars celebs. Note: my segment starts after +-26 minutes. The Guardian (Internet) – June 2010: British newspaper The Guardian ranked my old site in a Top 5 of Star Wars sites. Star Wars Insider (Magazine) – 2009: Issue 111 of Star Wars Insider features a photo of Gerald Home (Tessek) and me. 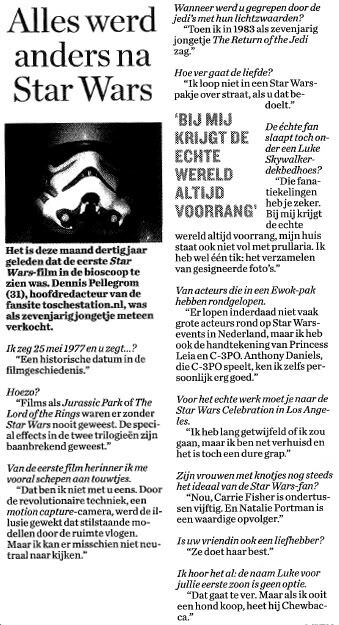 Parool (Newspaper) – May 2007: For the 30th anniversary of Star Wars I was interviewed for this Dutch newspaper.